Home » national news » Why is Pakistan's Azadi Express train covered with posters of Burhan Wani? Posters of Burhan Wani, the 22-year-old Hizbul Mujahideen commander who was shot dead by military forces on 8 July, have been reportedly posted on Pakistan's Azadi Special Express train. The train will go to Karachi from Peshawar on 14 August, Pakistan's independence day. 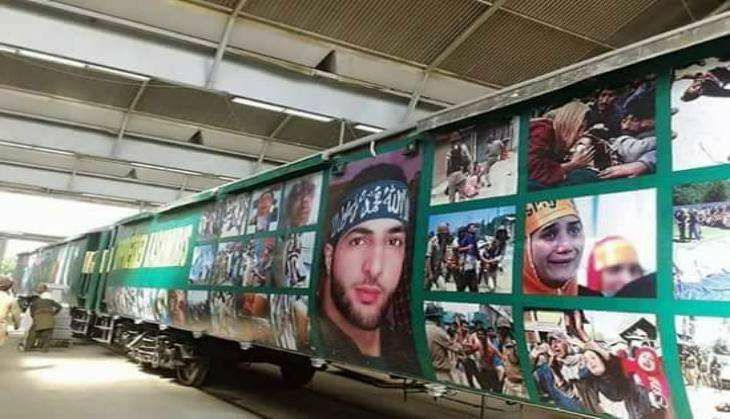 According to Aaj Tak, besides posters of Wani, the train is also covered with photos of Kashmiri civilians who were left injured during protests that broke out after Wani's death. Photos of the train with the posters were shared by a Twitter account, @sageelani, purported to be the handle of separatist leader Syed Ali Geelani. @sageelani tweeted: Special Azadi Train to leave Peshawar for Karachi on 14 Aug16. Commander Burhan Wani and other Kashmir pictures featured." In a bid to express solidarity with Kashmir, Pakistan observed 20 July as a 'black day'. At least 55 people have died in the clashes since Wani's death, with several civilians reporting serious injuries from pellet firing.